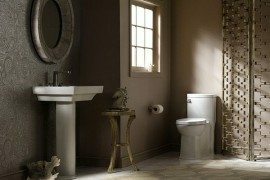 Unlike interior design ideas for bedrooms and living rooms, trying to pick ones out for your bathroom can often be a tad bit more challenging. 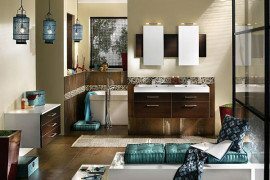 While most of us are pretty sure about what we need in the shower, a bathroom vanity is not something that we are very clear about. Most often that is because we do not pay enough attention to this aspect and on other instances, we are short on design ideas for it. 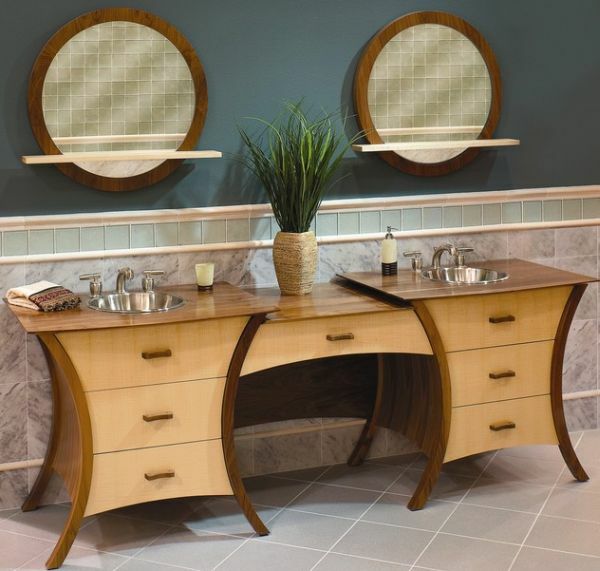 But most importantly, it is because many underestimate the beauty and charm that a well crafted and perfectly thought out bathroom vanity can add to a setting. 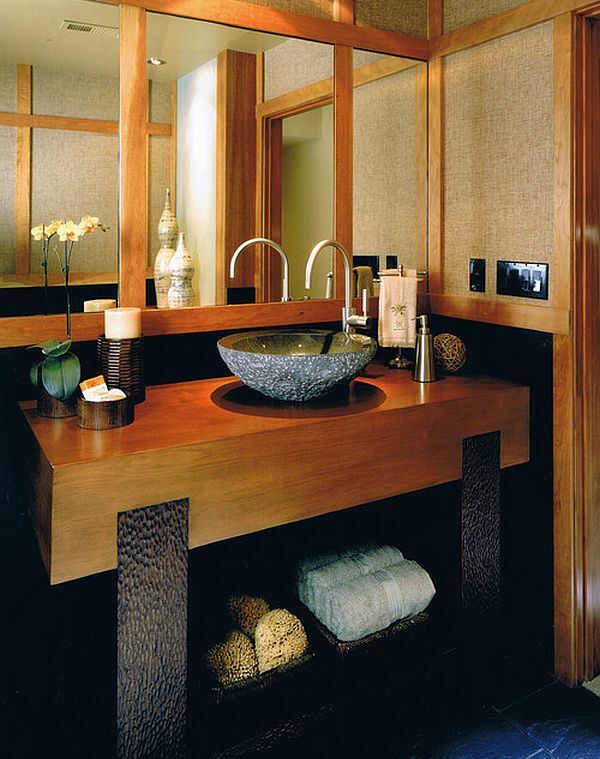 We start off with a bathroom vanity that will fit in snugly with most contemporary houses and the way they are going minimalistic with the interior design. 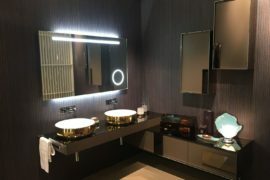 Following the trend is this cool and sleek vanity that uses dark and deep hues along with a shiny counter to effortlessly blend the black and white. 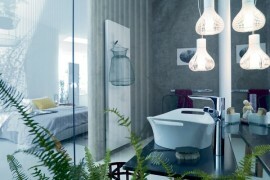 The modern faucet and the large mirror make it ideal for someone following a luxurious theme for their home. 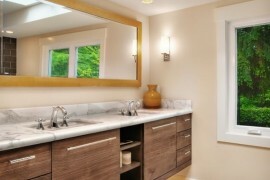 This bathroom vanity is not cluttered. It is great to look at, but is pretty simple to imitate and emulate, if you are aware of what you are doing. Ideally designed to fit in with most existing homes; the hand-crafted design along with the lovely grain of wood make it easy on the eyes. 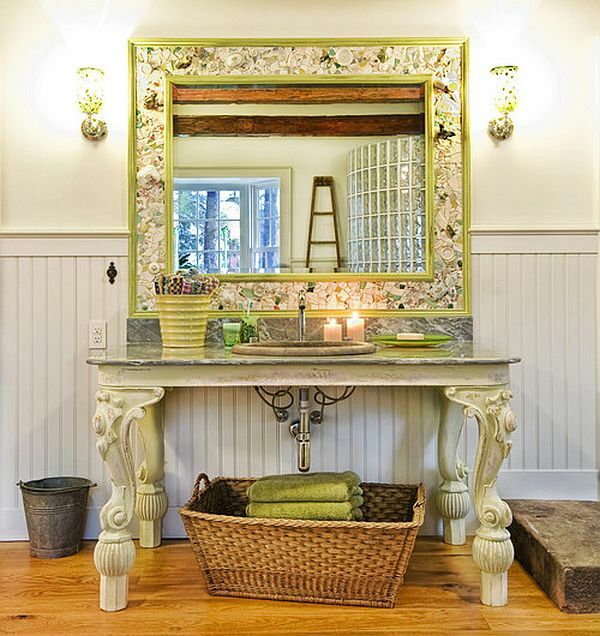 If you like the more floral feel, along with a wonderfully vivacious design that adds plenty of beauty to your home, then this bathroom vanity is absolutely perfect. 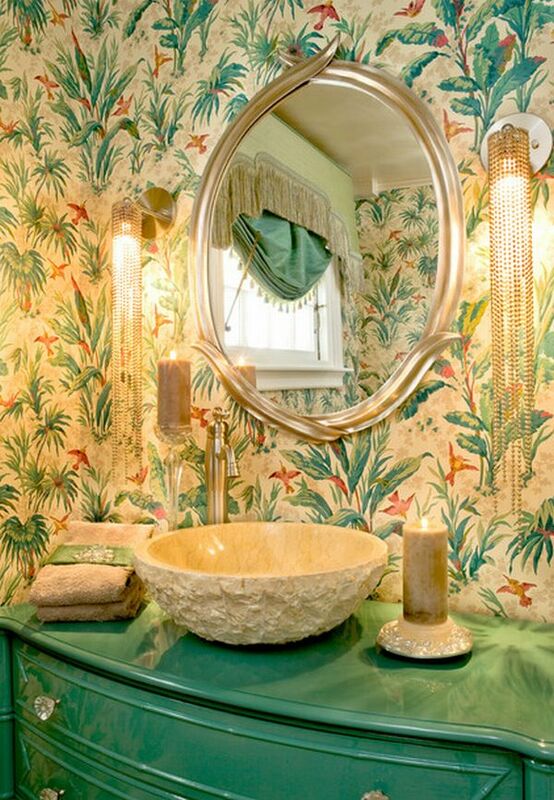 The oval mirror with metal frame and the bright and bold green cabinet give it a very regal and even a touch ‘oriental’ overtone. This is our own personal favorite with both beauty and blue coming together. The vanity really seems to transport you into another world with the jars lit in white and the background clad in beautiful blocks of black. If you are looking for one word to describe it, somehow ‘magical’ feels apt. 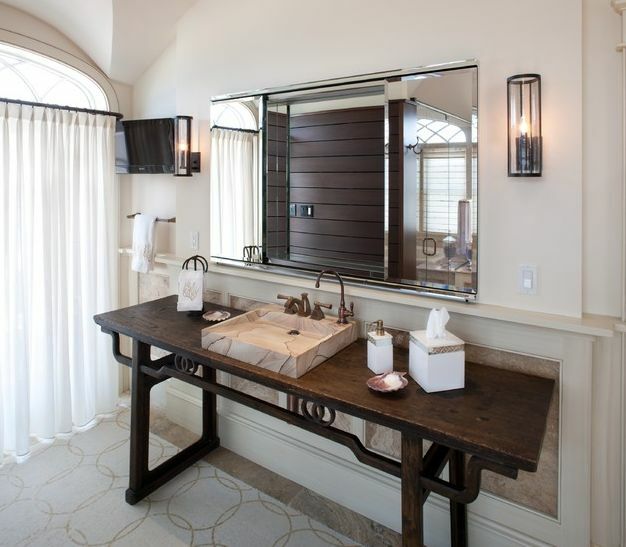 While all of us might not be blessed with bathrooms this lovely and relaxing, the vanity in show definitely adds to the look and feel with its classic style and a simple design that employs a re-purposed piece of furniture. 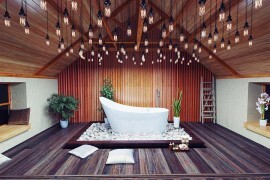 Exquisite and eco-conscious at the same time! 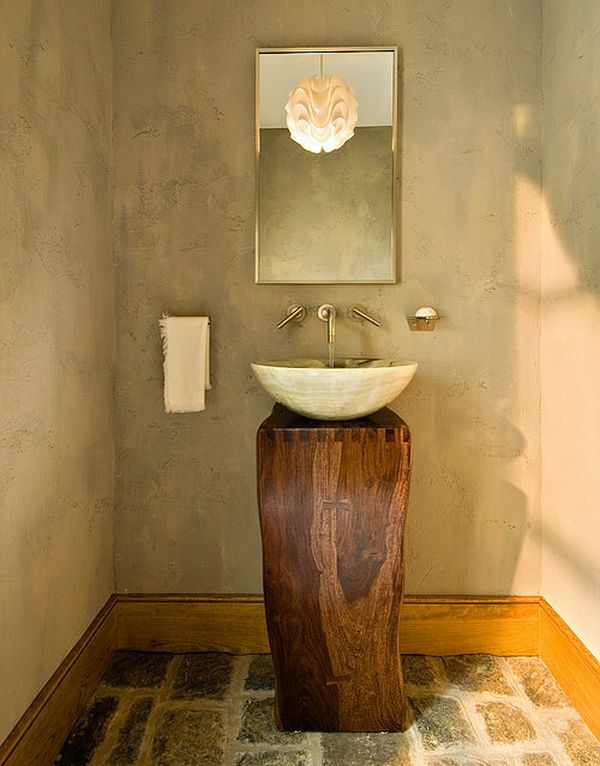 This is all about designing a vanity that syncs in completely with existing environment and this one has a very rustic look to it and that is what works so well. 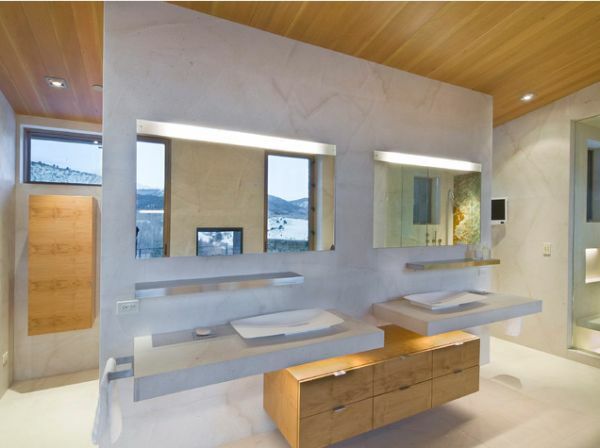 The ultra-minimalist approach along with the creation of the wall and the floor that give a stone-like impression, help pull off this style effortlessly. 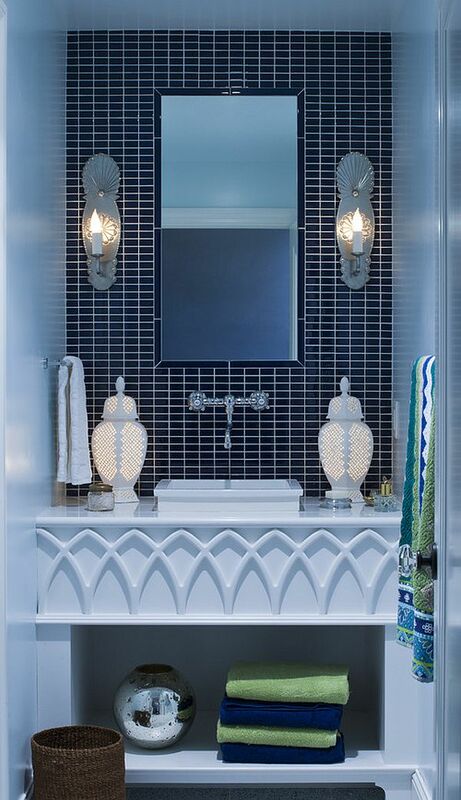 If you are looking for one bathroom vanity that will simply stand out from the crowd and light up as the ‘main event’ of the evening, then this one is just what you need. 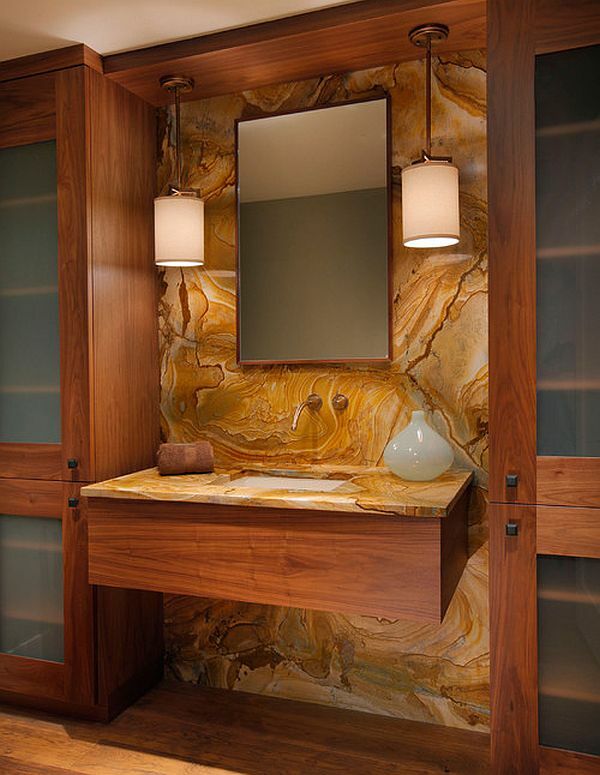 The single stone approach for both the countertop and the background works great, along with warm lighting and ample space underneath. Pretty Perfection! If you love the big round mirror and maybe cannot get enough of yourself, then this is what you want. 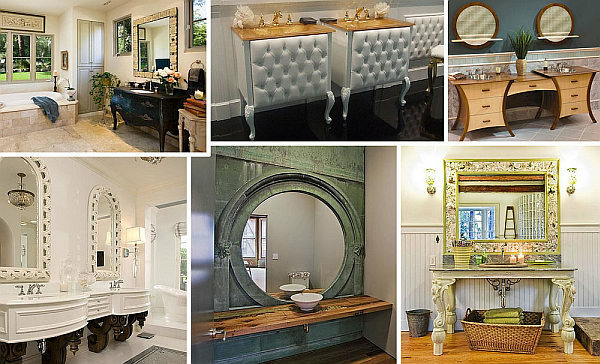 Apart from the big mirror, it takes a wall-to-wall design approach and that fits well if you have one whole side of your bathroom to spare. 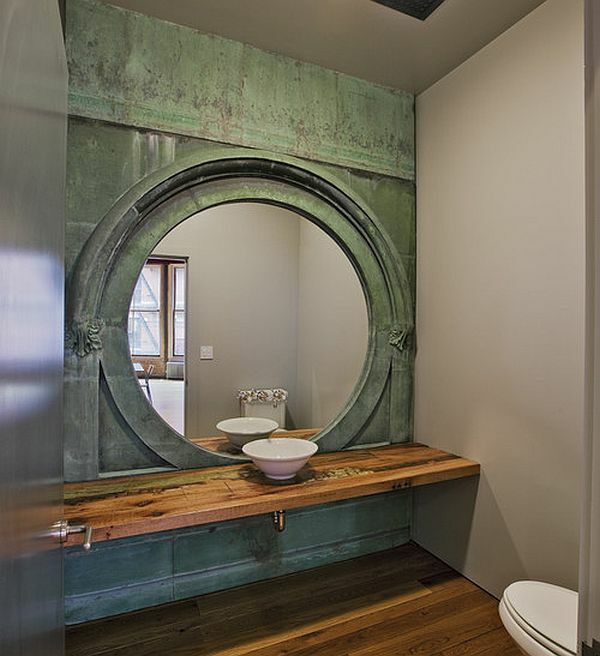 The green on the copper along with the basic countertop make it both effective and efficient. 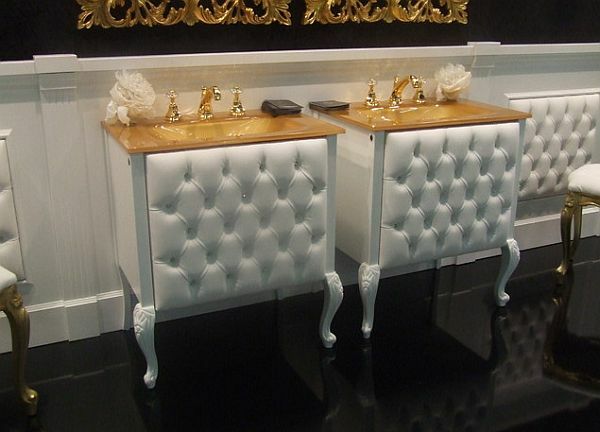 Here are twin vanities that have been custom-designed to incorporate corbels brought in by the clients. 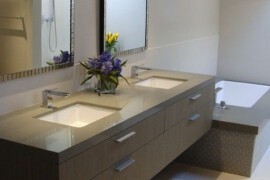 You can of course borrow from the look, if you have both the space and the home to match the twin-vanity look. This almost feels like a page out of the ‘White House Catalog’. This award-winning design might be hard to pull off even with expert help, but you can definitely incorporate many of the elements here in your design. 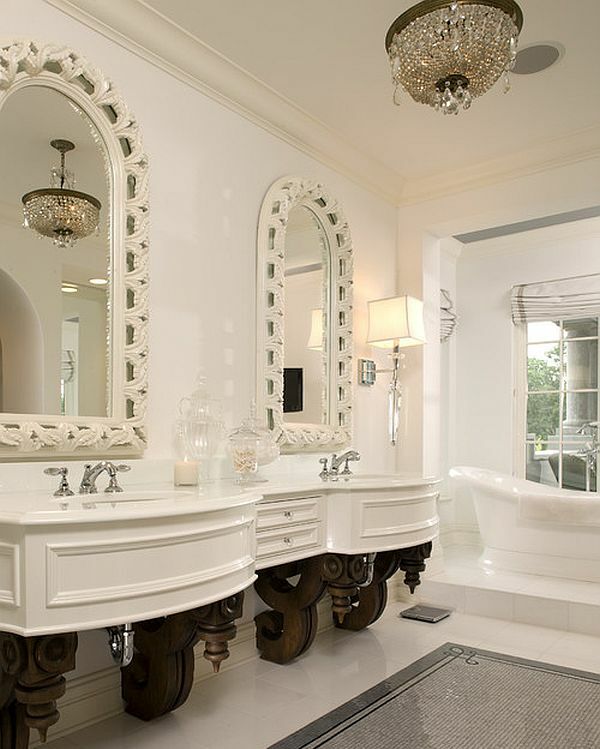 The legs of the vanity were crafted from an 1800s piano, while the mirror frame is simply stunning and fits in perfectly with the theme. The basket underneath and the entire look is almost a tad bit ‘British’ in its appearance! This curvy delight has an air of freshness about it and sits very well with an eclectic pattern along with a bit of natural green around it. While the wooden curves point to somehow a Japanese overtone, the design is both ergonomic and distinctive. Leather, Swarovski crystals and shades of golden hues make this one a vanity of the stars; or at least those who wish to be pampered like stars. 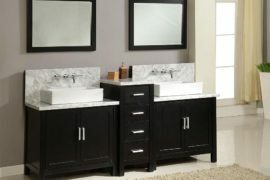 The designer vanity is all about luxury and while it might not be ideal for all, it looks great if you have a lavish home that will match its pomp.